Jason Brown is in the Peterhead squad for tonight's match against Dunfermline. Peterhead manager Jim McInally says defender Jason Brown will feature against Dunfermline tonight. The 22-year-old was a spectator at the Balmoral Stadium when his elder brother Jordon was injured while playing for Cove Rangers in Sunday’s friendly against Aberdeen following an accidental collision with Dons player Andrew Considine. The match was abandoned with Jordon receiving treatment on the pitch for around 30 minutes before being taken to hospital. McInally was relieved Jordon, who moved from Peterhead to Cove in the summer, received the all clear on Sunday night. The Blue Toon manager says he will have no hesitation in playing brother Jason in tonight’s Betfred Cup group match against Dunfermline at East End Park. He said: “I was hugely concerned when I heard the game was abandoned. I spoke to Jason as soon as I found out Jordon was injured. He was in the ambulance with him. “I have spoken to Jason and his father and Jason is happy to play against Dunfermline. Peterhead were on the wrong end of a 5-1 scoreline when they met the Pars at the same stage of the Betfred Cup 12 months ago. McInally is hopeful his side, who defeated Brechin City on penalties after a 0-0 draw in their Group D opener, can produce a more resolute display tonight. He added: “I was looking at the Dunfermline team from last year. They will only have three players in the team who played us last season. “They have signed some good players, such as Faissal El Bakhtaoui and James Vincent on loan from Dundee and Myles Hippolyte from St Mirren. They have a strong squad so we expect a difficult game. “Our result against Brechin was OK but our performance wasn’t great. “We are still chasing a bit in terms of our fitness and we need to improve with the ball. The pitch at Glebe Park was nice but the grass was long and not conducive to a good game of football. “We will need to play better against Dunfermline as we lost heavily there last year and the same could happen again. “The strange thing was we actually played quite well last year. 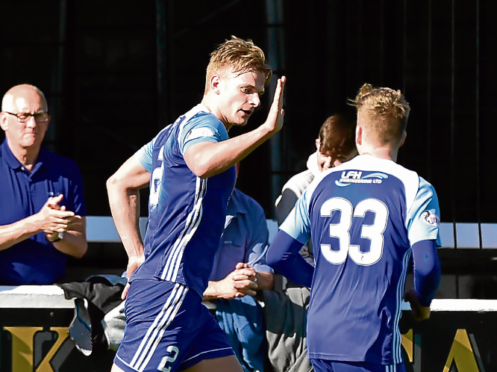 New signings Paddy Boyle, Derek Lyle and Michael Dunlop remain sidelined but captain Simon Ferry will start for Peterhead, having only returned for pre-season training last week.